Everybody loves ice cream, I mean it does not require any season to be consumed. It is eaten massively in summers as well as in winters, people also amalgamate it in waffles, lava cakes and with shakes as well. So it is never a ‘NO’ from any person of any age for a scoop of an ice cream. There are many flavored ones available in the markets and under big labels one can devour the delight consisting from sweetened to semi-sweet ice creams. Malls also arrange ice cream extravaganzas, stalls, museum and Iceland ice cream festivals for people because ice-cream is love and it is also never very expensive. My today’s post is also devoted to the world of ice-cream. 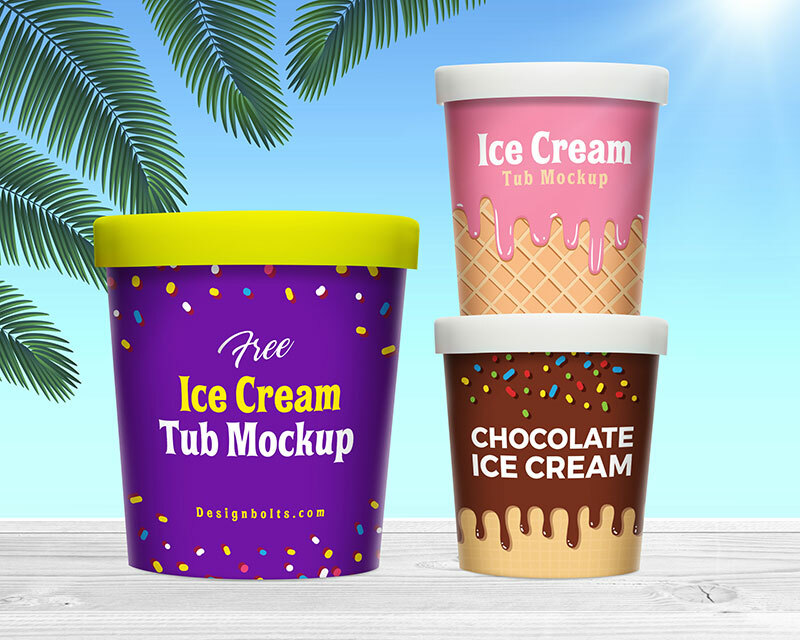 Down here you will see a free ice cream bucket tub mockup that can be implied both in commercial and personal projects. You may insert in your own fonts, colors, ice cream scoop images or any element being demanded and asked by your dear client. It is ready to serve you. Mockups are always a good option to go about if a designer is to make an awesome and stunning presentation, at least it is a doorway to the entire thought that how it will appear in actual form and the client also gets satisfied after having the design look inside a professional frame of a mockup. I have been designing mockups of various kinds so they are ready to be used straight away. Since designers find it difficult to manage innumerable stuff, mockups are a good way to go about (for making a presentation) without having second thoughts. For more freebies and some interesting design feed, stay tuned to the blog, we love to accumulate the best stuff for you all, the more good feedback we have the more motivated we feel on the whole to work better and to prove ourselves. Our team of pro designers make the new designs every day and also bring forward innovative & creative collection to help you with your on-going or upcoming projects. Just follow up and subscribe for the new updates in future as well. Here we go. 3. And don’t forget to follow us or subscribe to receive for more high quality premium freebies & awesome articles only.